Embroiderers' Association of Canada, Inc.: Why Do We Stitch? First, I need to do some administrative house cleaning. To anyone who did not receive our Embroidery Canada Fall 2011 magazine (during the postal problems). Please email our Membership Director Kathy Taylor at membership@eac.ca and she will forward a copy to you. Our new Webmaster Tara Kohinski has been working hard developing our new website. She has asked that members send her photographs of their stitching. Please send your photographs under the subject line EAC Web Photos. 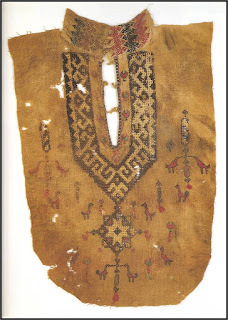 Please send high resolution photographs with the Name of the piece, Name of the Stitcher, Name of Designer and whether the piece is a kit/pattern or original design. The evening program group (Christy Thomasson and Pat Armour) of the Toronto Guild of Stitchery presented a narrated slide show of beautiful stitched garments from the past to the present called “Clothed with Passion.” The reasons or motivation for creating beautiful stitched masterpieces were so intriguing that I felt it would be interesting to share. 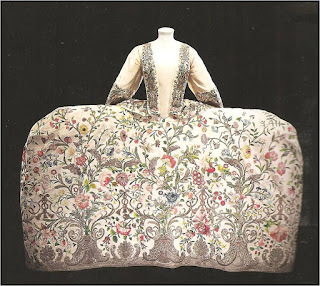 Stitching in Victorian times was often accomplished by seamstresses. The development of a stunning design and the need for the exactness of fittings were part of producing a special garment. 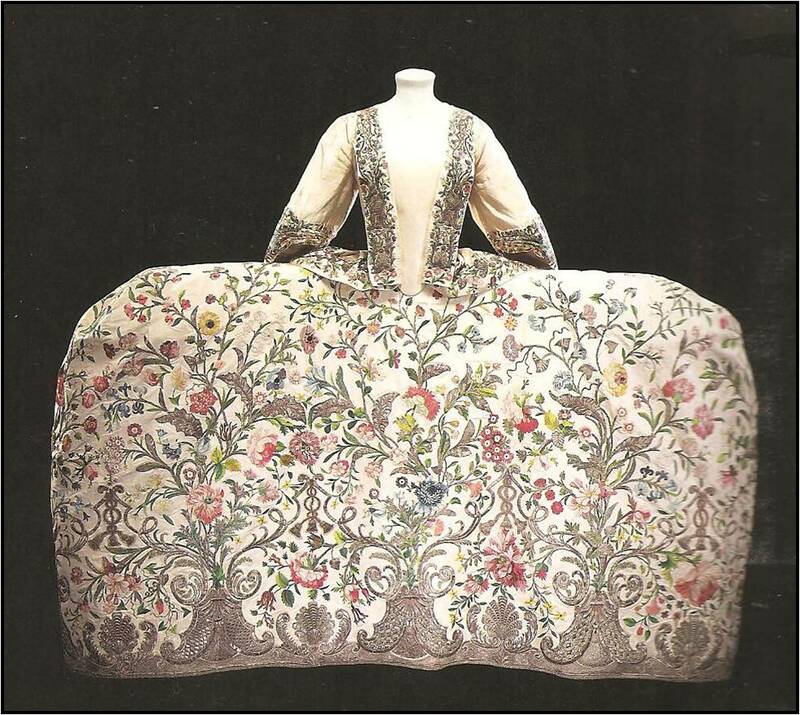 The garment when worn was an indicator of status and wealth. What I found very interesting was when the owner was no longer interested in the garment she would pass it along to her servant who would continue to enjoy the article of clothing and increased status within her circle of friends/family. Today we have recycled clothing but the value of clothing as a piece of art is mainly common only as an haute couture designer piece. Another angle to the wealth and beauty in clothing can be seen in ethnic clothing created in India. 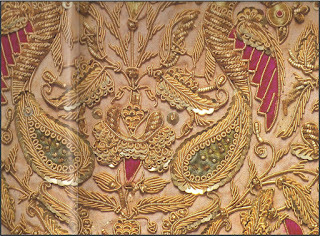 Garments embellished with real gold were considered a dowry or down payment of the bride’s family to the groom. The gold in the clothing could be reclaimed if economic times required it. For “Ladies of the Evening” who occupation required clothing to impress customers also purchased clothing as an investment. They required garments that could be used as ready currency if the need arose. Wonderful stitching has also been created as a demonstration of devotion to God. 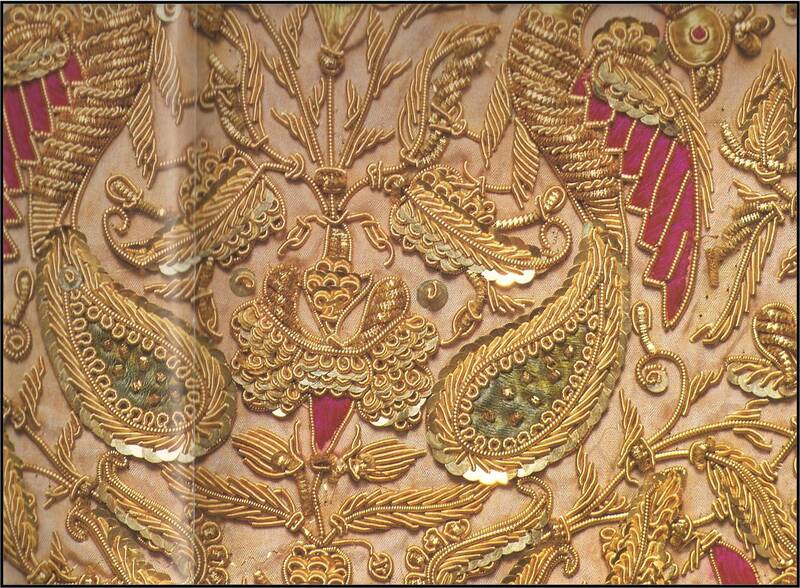 Beautiful religious vestments and alter clothes added to the spectacular presentation of the religious service. Everyone has a reason for stitching. Stitching can allow us to adorn our homes, provide gifts for our friends and relatives or simply as a means of expressing ourselves. Stitching can enable us to celebrate the joy of a wedding or birth. In Victorian times stitching as a form of mourning the loss of a loved one involved stitching a piece of hair into the sampler. Whatever your reason for stitching we are so fortunate to appreciate what has been done in the past and look forward to what will be created in the future. Stitching is old and yet so young and vibrant. Let’s keep stitching! !